Take a closer look at our camp management software. You’ll see that Campwise is different from all the rest. Campwise camp and conference center software is the right choice and the only software you need to run your camp. Our proprietary Common Records database allows you to sync everyone’s information into one record for safe storage and ease of record retention. The foundation of Campwise is our Common Records database structure which all the major components are built upon. This innovative database design simplifies the storage and maintenance of data while providing rich historical tracking. Data that is unique such as persons (campers, parents, staff, donors, etc. 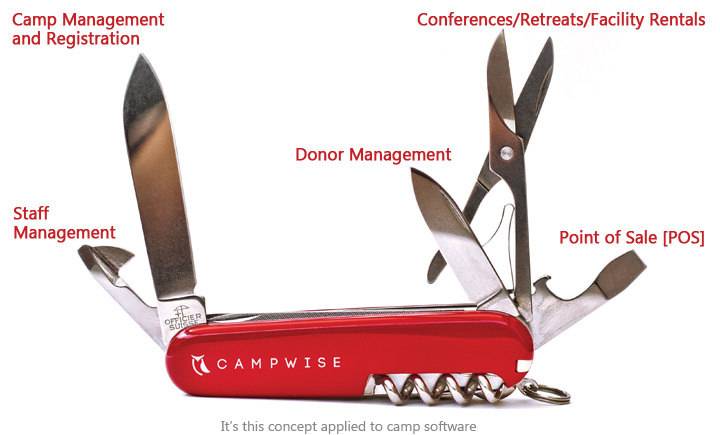 ), organizations (donors and retreat groups), addresses, phone numbers, and email addresses is only stored once but accessed from all the major components in Campwise. Cloud-based access allows you to access records from anywhere on any device. No longer run back to camp to check on a registration when you’re out at meetings. Simply log in and take care of any issue quickly and efficiently. Reports and emails can be scheduled using Campwise software which frees up your time to do what you do best: Run your camp. Campwise provides camps and conference centers with a complete software solution that includes rich online functionality as an integrated part of the package. This allows data to flow seamlessly between camp side management functions and the online applications.